One could argue that Lucky Zodiac blends features of both traditional Microgaming slot gameplay, and modern Microgaming slot gameplay. Lucky Zodiac is one of Microgaming’s latest video slots. The title features a total of 5 reels and 20 paylines, which is rather small for this developer. The Lucky Zodiac video slot, features high playing card icons, as well as several zodiac and astrology themed icons on its reels, as it tries to reveal a tale of fortune telling, and fate. Up to 560,000 coins be won in the Lucky Zodiac slot machine. 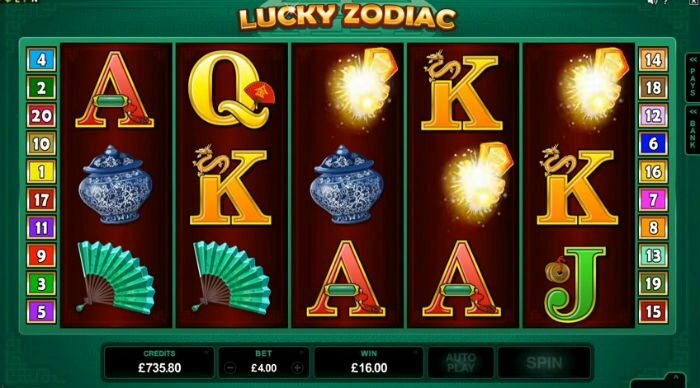 We will begin this Lucky Zodiac slot review by looking at the Lucky Zodiac slot graphics. The high playing cards appear as the lowest paying symbols in the game, whilst the best paying ones include oriental imagery, including lanterns, fans, lilies, and Ming vases. Graphically, Lucky Zodiac is a bit behind other Microgaming titles, even if it is one of their newer slots. Lady luck on your side? Below the reels of the Lucky Zodiac slot game is the menu bar. This is the place where you can adjust your stakes and bets. You will be able to adjust any of the 20 paylines which feature in this slot, and you can pick coin sizes of 1p up to £2. You will also be able to wager as many as 10 of these per line. Minimum and maximum wagers in this flexible slot therefore stem from a low of 1p per line, per spin, up to a hefty £400 per spin at its most costly. Lucky Zodiac is goes back to basic, which may not suit some players. The Lucky Zodiac icon in the standard wild symbol in the video slot. The Lucky Zodiac’s wild can replace all other symbols, barring the scatter icon. It is also pretty useful at handing out good wins, too. During the free spins bonus round, a separate wild appears. It takes the shape of Aries (the ram, from the Zodiac). This symbol is only wild during the free spins feature, and just like the standard wild, it can replace all other icons, save for the scatter. The aforementioned scatter is shaped like Chinese fireworks, and offers scattered wins for 2 or more icons appearing anywhere on the reels. The Lucky Zodiac slot also features a gamble bonus. It has been a while since we’ve seen one in a Microgaming slot. This feature can be activated after any spin, allowing players to guess a card colour, or suit, to double or quadruple their winnings, respectively. Guess incorrectly, and you’ll lose it all. The biggest offering Lucky Zodiac slot bonuses naturally come in the games bonus round, which is a free spins feature. It is triggered by landing 3 or more scatters anywhere on the screen. Players can win a total of 12 free spins, with all of those winnings being gifted a multiplier worth as much as 7x their normal rate of pay. Free spins can be retriggered, and during the feature, you’ll have the two types of wilds, as mentioned. The main perk about the Lucky Zodiac slot machine, is also its main problem, depending on which side of the argument you fall on. 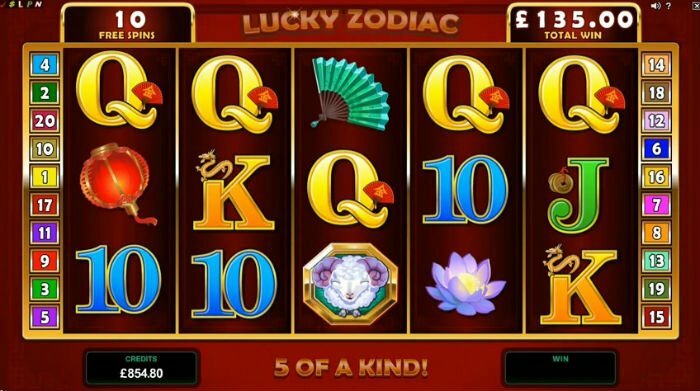 Some will say that Lucky Zodiac is great, since it represents a new slot which has returned to Microgaming’s roots, especially in terms of gameplay. Others will argue that it maybe a new slot, but it is too dated, and has a theme which has been immensely overproduced. One could argue that Lucky Zodiac blends features of both traditional Microgaming slot gameplay, and modern Microgaming slot gameplay. For us, it’s neutral, so it’s ultimately your decision.